How are target markets evaluated? The selection of target markets involves the examination of various aspects and measures of a market segment in comparison to the firm’s goals and resources. Typically the firm assesses whether this particular target market logically fits with the firm’s strategic direction, whether it is the best use of its resources (opportunity cost), and to what degree with a firm be able to successfully compete in the segment. Target market selection is a very important decision for an organization as it is an integral part of their marketing strategy. As consequence, firms will typically adopt a fairly analytical approach to target market selection and will usually use to set criteria to evaluate and assess each market. 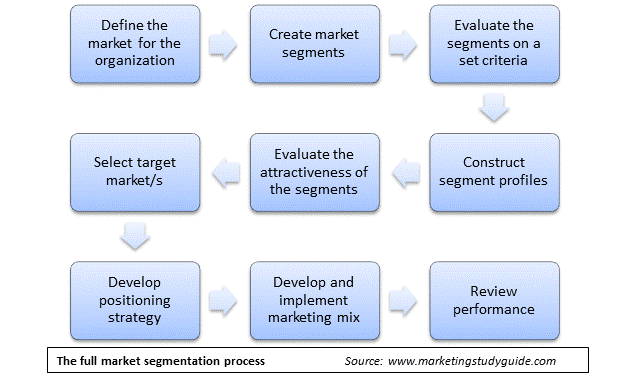 As can be seen in the following model of the full STP (segmentation, targeting and positioning) process, the selection of target markets occurs after a number of important steps. Firstly the organization defines the product/market that they are interested in, they then group consumers into different market segments using a variety of segmentation bases/variables. After the segments have been validated, segment profiles are developed. Then, using the information in the segment profile the target potential target markets are evaluated and selected, most likely by using an established model or other set of minimum requirements. The following table outlines the main factors that are considered when evaluating potential target markets. It is likely that many organizations will have slight variations to these factors, but the table provides a good generic guide to the key issues. Segment size What is the size of the segment (mainly in terms of unit and revenue sales)? And is this substantial enough for the firm to consider entering? Each firm is likely to have minimum size requirements for a market segment to be considered financially viable. Obviously larger firms have higher requirements. Segment growth rate At what rate is the segment growing (or perhaps declining)? What is its future outlook? Segments with strong growth rates are more attractive as firms can gain market share from primary demand (as opposed to needing to win business from established competitors). Profit margins Is this a high profit margin segment or one that is price competitive? Pursuing new target markets typically requires significant marketing investment, so target markets with higher profit margins are always more attractive. Competitors How dominant are the established competitors? What degree of competitive rivalry exists? Are there significant indirect competitors (or close substitute products)? Generally firms do not want to compete in markets where there are dominant market leaders, as they tend to be quite aggressive to new competitors. Therefore, target markets with a fragmented competition position are often preferred. Obviously the lower the level of competitive rivalry the better with limited in direct competition.Note: Porter’s five forces model could be used to assist this style of analysis. Distribution channels How easy would it be to gain access to the appropriate distribution channels? What level of new investment would be required in this regard? Strong relationships between the current firms in the distribution channel would be of concern. The ability to establish suitable channel relationships needs to be evident. Strategy How well does the proposed target market fit with the firm’s strategic direction and growth goals? As part of the firm’s mission and strategy statement, a clear direction of the future of the organization is generally understood and planned out. Therefore, the target market needs to contribute to the firm’s strategic future. Goals What does the firm have high or low growth expectations The firms with higher growth goals are more likely to adopt a multiple target market strategy and will, therefore, be more willing to enter new markets. Resources Does the firm have the financial position and staff resources to successfully enter in this segment? Firms seek target markets where they can enter with a comfortable level of investment, in terms of: financial investment, staff time, and the potential disruption to the balance of their business. Capability Does the firm have the capability to develop appropriate products in a supportive marketing mix Firms will naturally seek target markets where they can leverage their existing skills, capabilities, and technologies.Target markets that require the firm to develop new expertise are generally best avoided. Role of brand Would the firm be required to create a new brand, or could an existing brand be leveraged into the new target market, or is brand relatively unimportant? Establishing a new brand requires time and money, so that requirement reduces the attractiveness of a segment. As does the risk to a brand of leveraging in into a lower status segment, such as when targeting budget conscious consumers. Growth options What is a range of other opportunities available for growth to the firm Market development (new target markets) is simply one growth. An organization could also consider market penetration, product development, and even diversification or acquisition. Therefore, given the growth choices available, is the new target market the best option at this time?